I’m on TV! Also: Fireflies. Here’s the link to my Newschannel 13 Live at Noon segment. And if you are my personal FB friend and you “like” Capital District Fun, I apologize for inundating you with this link over and over again. Tonight I was still working on the KidsOutAndAbout.com newsletter, and meanwhile J was driving me a teensy bit crazy by not going to sleep because Cute W and M were out and it would be Horribly Unjust for her to go to sleep in spite of her weariness. Plus it was too hot for upstairs, so she was on the couch. And next thing I knew, I’d consented to firefly-catching. I can’t resist how much she loves it. All those lights in the night really are magical. And I recommend a net: it makes catching easier and less traumatic (I think; I am not actually an ornithologist) for the bugs. 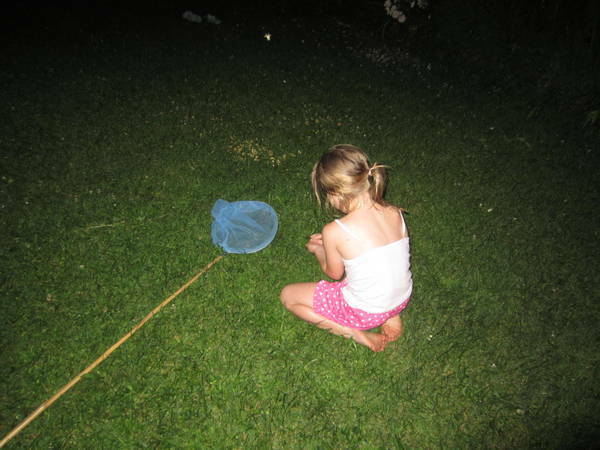 UPDATE: I got an email from Debra Ross, my KidsOutAndAbout publisher titled “You WERE tired last night!”: “Regarding the Capital District Fun post: You’re not an entomologist. Of course, you are also not an ornithologist. But I think entomologist is the relevant profession-that-you-are-not. ” You know, I almost pulled it up on dictionary.com but I was just too lazy. Ornithologists are for the birds. Thank you all for your patience. I slept in until 8 am today! Whoot, woot! @Nancy, I’m in Niskayuna, and we see plenty of them, so I expect that you’d be able to find them at any local park or playground. . . the Crossings, maybe? Of course, it’s too chilly right now, but surely spring will come eventually.